We interrupt our regularly scheduled episode to bring you a special episode celebrating the life and work of Murphy Anderson. Murphy Anderson passed away on Oct 22, 2015. This episode we look at Showcase 34. Title: "Birth of the Atom"
Using a white dwarf star fragment, physicist, Ray Palmer, has developed a lens which will shrink inanimate objects when ultra-violet light is sent through the lens. However, Ray has been unable to perfect the process because the shrunken objects always explode withing minutes. Visiting an underground cavern on a nature hike with his girlfriend Jean Loring and a nature club, Ray becomes trapped inside with the group during a cave-in. Exploring the cave, Ray locates only one tiny opening. He uses the sunlight, beamed through the lens to shrink himself to tiny size. Then using the diamond from his ring, enlarges the opening until people can safely pass through. Worried that he might explode, Ray hurrys back to the lens and enlarges himself back to normal. He is surprised that he did not explode and hypothesizes the cave water may have altered the properties of the lens. 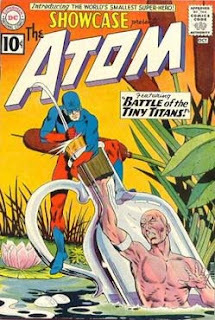 When he returns to his lab, objects still explode when shrunk, leaving Ray to conclude that his own body possesses a mysterious force, enabling him to survive the shrinking process. Title: "Battle of the Tiny Titans"
A tiny genie appears in a bank and steals money before disappearing. Bank Teller, Alma Wilson, is accused of the crime, prompting her to ask her friend, Jean Loring, to be her attorney. 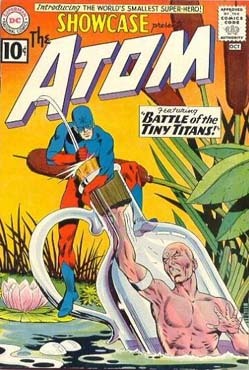 Jean’s boyfriend, Ray Palmer, who has just finished designing a costume which appears only when he shrinks to tiny size, as the Atom, encounters the genie in his lab. After a short scuffle, the genie explains he is an alien, Kulan Dar, who has become trapped on Earth. He is being controlled by a small time criminal because he needs the element Europium to return home. After Kulan Dar disappears, Atom tracks down the crook, Carl Ballard. Ballard commands the alien to defend him, forcing the tiny titans to battle each other. Atom delays Kulan Dar long enough to gain possession of the dominator device Ballard used to gain control. Kulan then confesses his crime in court, which frees Alma, and leads to Ballard arrest. While you're at it, check out my fellow podcasters also celebrating Murphy Anderson's life and work. Here is the listing as of right now... but listen for others to join in. Finally, one of our own also died recently. Squadmate and fellow podcaster, David Spoko passed away.